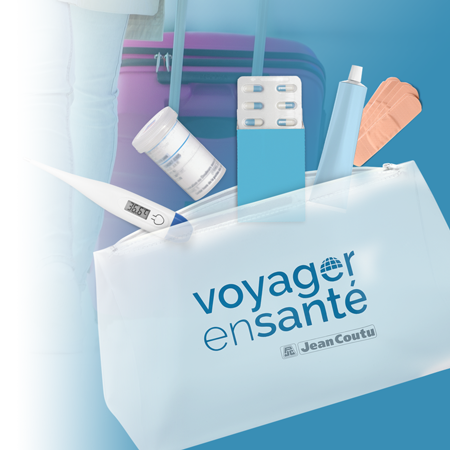 Unexpected circumstances are part of the joys of travel; but when health issues occur, a travel health kit provides valuable support! Regardless of the chosen destination, whether for business or pleasure, it can be very helpful to have a well-stocked travel health kit readily available. Because we never know what we may encounter, it is best to have thought of everything—or just about. The contents of your travel kit must of course be adapted to your travel destination and to the conditions in which you will be travelling. First aid supplies and medications may not always be accessible in other countries or may differ from those offered in Canada. It can be difficult to anticipate the difficulties that might occur during the trip. This is why it is important to think ahead and to make a list. The person best suited to help you is undoubtedly your pharmacist. Speak to him/her shortly before your trip. If you are travelling with a child, it is all the more important to ask for advice from your pharmacist. Not only will he/she help you to choose the appropriate products and medications, but he/she can determine the doses that should be administered if needed. supplies to treat minor injuries such as an antiseptic cleanser to apply to wounds, an antibiotic cream or ointment, different sized bandages, adhesive tape, gauze, etc. LEAVE ON A TRIP WELL EQUIPPED AND WELL INFORMED! all of your medication and a thorough list of all the products you are taking, including prescription medication, over-the-counter medication, and natural health products. the list must provide the brand name and the generic name for each product, the complete dosage, the name of the prescriber, and the name and contact information of the pharmacy. the pjc medication list is the perfect tool, as it’s an up-to-date summary of your prescription file. ask your pharmacist to print it for you. Your medication and your medication list should be with you at all times; keep them in your carry-on. Bring more medication than necessary for the duration of the trip in case of an unforeseen delay. Your pharmacist is a valuable ally to adequately prepare for a trip. In addition to providing good advice, he/she can prescribe medication intended to prevent mountain sickness or malaria (paludism) and to treat travellers' diarrhea, if your situation requires it and if you meet certain prescription criteria. Fill out the form provided below, and bring it for your next visit at the pharmacy!